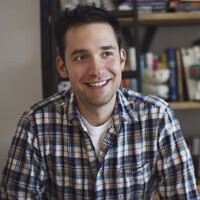 In the third iteration of a new feature called Home Screen, Reddit co-founder, bestselling author, and “mayor of the Internet” Alexis Ohanian shares his iPhone’s home screen. 1. Mailbox: I probably use Mailbox more than any other app (still not inbox zero—one day!). 2. GoogleVoice: [I use] GoogleVoice for SMS because I love having texts show up in my inbox and loathe unexpected phone calls. 3. Couple: It’s been saving my relationship while I’m on the road for my five-month Without Their Permission book tour. 4. Frontback: It’s my guilty pleasure. Finally an app that combines the selfie with a POV shot that almost makes the former socially acceptable. Almost. 5. Secret: Another app I’ve backed, but this one just dropped a week ago and I haven’t been this addicted to something since Steve and I started reddit. 6. Pandagrams: I’ve got them handy because they did a fun limited photobooth campaign with the Chinese New Year (and I need to remember to show it to my goddaughter when I’m back visiting her in SF) —this is a spinoff from the popular Hullabalu interactive storybook series featuring Pandora. 7. Genius: It makes sure I know all the lyrics to the songs I’m singing to myself on my commute.